Raaii and colleagues’ article in this month’s CJSM concerning patterns of mouthguard utilisation in minor hockey players introduced me to the terms ‘Atom’ and ‘Pee Wee’ as applied to Ice Hockey. I had heard of ‘Pee-Wee Herman’ before, Paul Rubens’ fictional comedic character, and ‘The Mighty Atom,’ Sydney Charles Wooderson MBE who was one of Britain’s greatest middle-distance runners in the 1930s and 40s, but had not heard of the terms ‘Atom’ and ‘Pee Wee’ as applied to Ice Hockey. After a little research, I was able to find out that they refer to specific age categories. The relevant age categories in Canada are as follows – Mini-mite (1-2 years old), Mite (3-4), Tyke (5-6), Novice (7-8), Atom (9-10), Pee Wee (11-12), Bantam (13-14), Midget (15-17), and Juvenile (18-20). Interestingly, the nomenclature is quite different between Countries. In the United States, for example, the Mini-mites category of players are aged 5-6 years old, with Mites from 7-8, Squirts 9-10, Pee-Wees 11-12, Bantams 13-14, Midget-minors 15-16, Midget-majors 15-18, and Juniors of ages 16 and over. In France, there are moustiques aged 9 and under, Poussins 10-11, Benjamins 12-13, Minimes 14-15, and cadets 16-18. The relevant age categories as defined by the German Ice Hockey Federation in Germany consist of Kleinstschüler (bambini) aged 8 and younger, Kleinschüler 9-10 years old, Knaben 11-12, Schüler 13-14, Jugend 15-16, and Junioren 17-18. In Switzerland, the Schweizerischer Eishockeyverband (Swiss Ice Hockey Federation) defines ages categories for Bambini (9 years old and younger), piccolo (10-11), Moskito (12-13), Mini (14-15), Novizen (16-18), and Junioren (19-20). 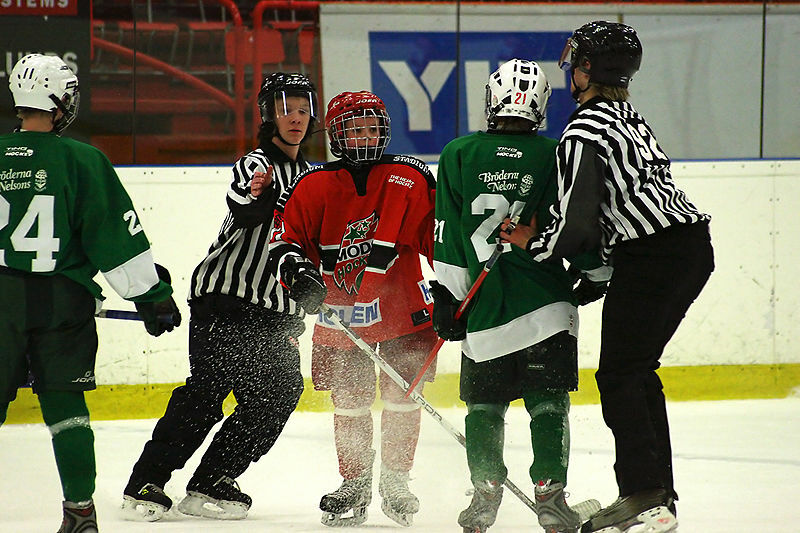 The Swedish Ice Hockey Federation defines perhaps more conventional nominal age categories of U11 (11 and younger) and above for each age from U12-U16, with U18 and U20s categories. A few issues come to mind here. One relates to the differences in the age categories for the same named categories in different Countries which could be confusing to some. For example, the Mite category in Canada describes those aged 3-4, but in the US the term would refer to the 7-8 year old category. Another issue concerns the names for the age categories themselves. Whilst some of them might be considered as quaint by some, and might indeed possess a certain National and cultural heritage, to others the age category names might appear to be strange or at worst, even insulting. For example, the term ‘squirt’ is defined in the Oxford English Dictionary as a ‘puny or insignificant person,’ or in the US Oxford English Dictionary as an ‘insignificant, impudent or presumptious’ person, and as such would be seen as an insult to many people. Should we be moving towards using an accepted International standard nomenclature for age categories in Ice Hockey based perhaps on the Swedish system, or do you think that we should continue to encourage the use of regional nomenclature? Let us know your thoughts. In the meantime, it would seem that it pays to know your Pee Wees from your Midget-majors !